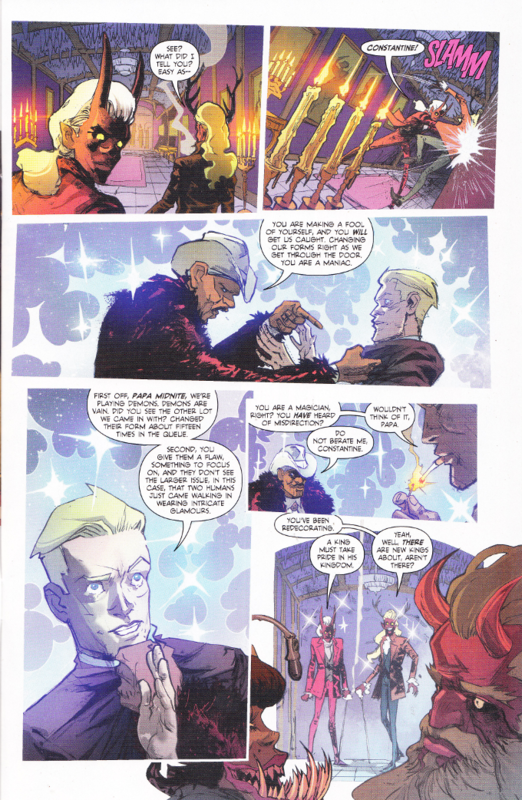 John Constantine and Papa Midnite have a long history together. It is not a happy association for either of them. So it is with the utmost reluctance that Papa Midnite enlists John's help. Even when said enlistment involves him threatening the life and soul of John's latest lover. John's not too thrilled about the arrangement either. But he can't fault Midnite's logic in recruiting him. For Midnite has lost his place of power to a demonic scheme. And John's the only person who has successfully stolen from Midnite and escaped with their body, mind and soul intact. But crashing the VIP Room of The Damned to win it back for Midnite will test even John's base cunning and bravado. The artwork by Riley Rossmo, Brian Level and Ivan Plascencia is the star of the series this month. Much of the comic is made up of a series of amazing two-page spreads that are fantastic to look at but hell to scan if you're a comic book critic. Everything looks amazing, though one of the spreads requires the book to be turned sideways - a gimmick from the 1990s I don't miss a bit. The script by Ming Doyle and James Tynion IV proves equally vivid and detailed. 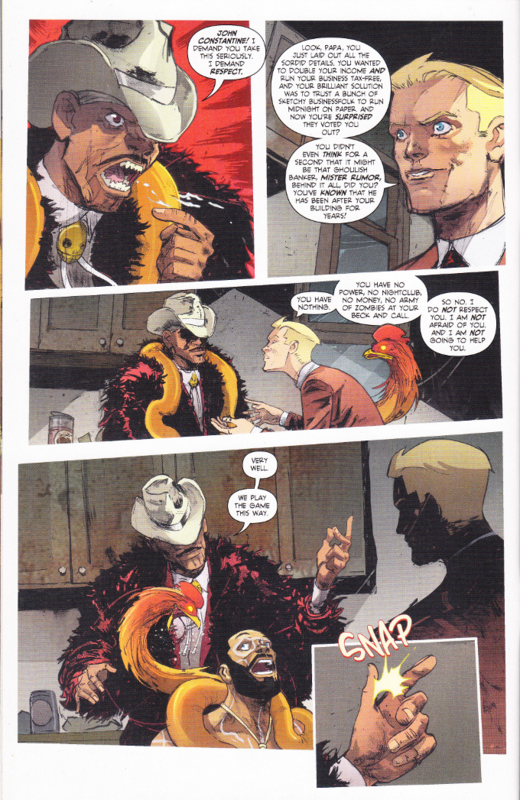 I've never been crazy about the decision to turn Papa Midnite into an arch-enemy of John Constantine but I do like the way the character is handled here. And props to Doyle and Tynion for bringing back The Demon Neron in style and throwing out a reference to Underworld Unleashed.